We met her the first week in December 2012. The very second we set eyes on her, we were smitten. 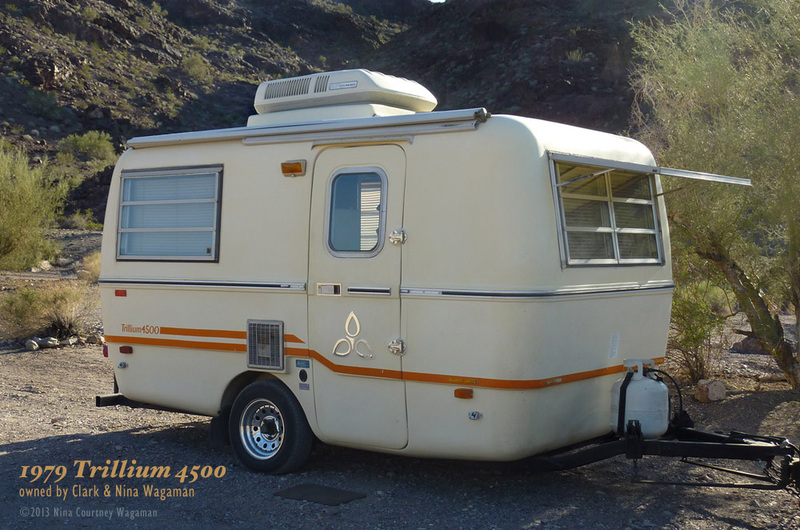 A sweet buttercream “glass egg” trailer, she charmed us with her clean good looks and splendid health. All her systems were in working order––remarkable for her nearly thirty-four years of age. As she welcomed us inside, we found her diminutive size perfect for us. We were completely taken over with the excitement and anticipation of getting to know her and enjoying her companionship. Clark and I are still amazed that the chaos of the universe managed to bring us to her––and to her caretakers, Lloyd and Judy. They welcomed us and made us feel like special friends right away. We spent hours talking and found we had much in common. 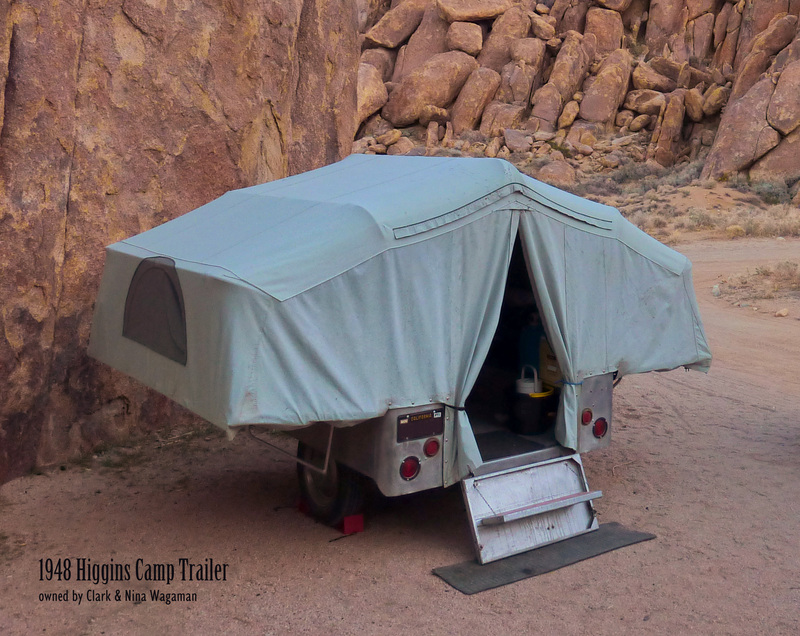 We told them how we were camping with our other vintage trailer, a 1948 Higgins. Lloyd, especially, was excited to meet our old pal. 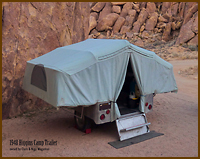 Next day, we towed him down from the campground and introduced everyone. We don’t think Mr Higgins was too upset upon meeting our new love. He had plenty of his own admirers that day! Then, apologizing for our disregard, we abandoned him to cozy up overnight with our latest infatuation. She was everything we had dreamed of and we were like kids snuggling with a new puppy! It was time to leave our new sweetheart behind. She would wait for our return. We had come to the dance with another partner––dear Mr Higgins was our companion. Waving farewell to our new friends, Lloyd and Judy, we drove away without her, Higgins following obediently behind Zuzu, our trusted Trooper. Our new love would be safe in the hands of those who had been caring so well for her. Three weeks later, we returned as promised. We made her an official member of our family of vagabonds and towed her home to California, happy to be once again wrapped in her cozy embrace. We call her Miss Trilly, an endearment of the proud Canadian Trillium family name. 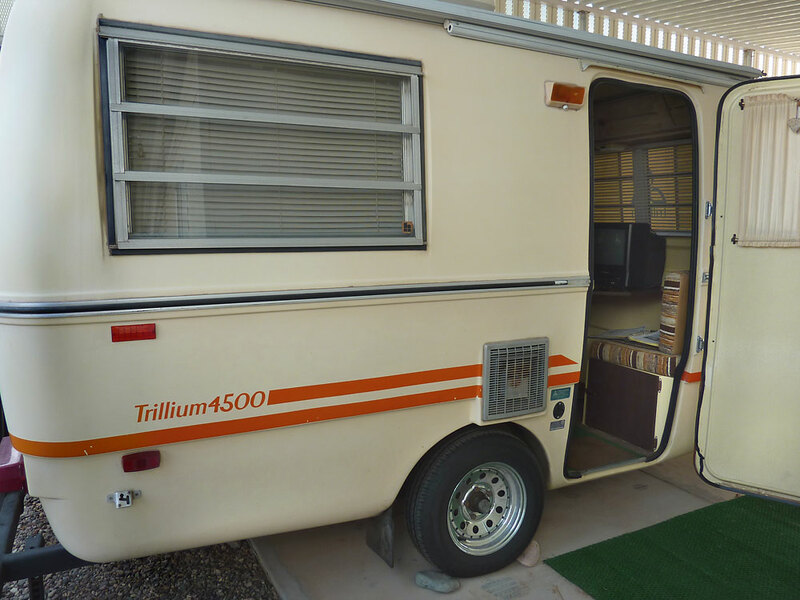 She is a 1979 Trillium 4500, a vintage fiberglass trailer. We introduce you to her now, as she was when we first met. Isn’t she simply lovely? Can we see any interior photos? Interior photos are on the way. We just started setting up this blog on January 27th and folks are already finding it! Truly amazing.